Medical doctor and a teacher. Frederick Nkomo was born in Makapanstad near Pretoria in 1915. He was the son of a Methodist minister, Abraham Nkomo, and attended primary school in Mafikeng and Klerksdorp. His secondary education took place at St Peter’s School in Rosettenville, Johannesburg and he matriculated at the Healdtown Institute near Fort Beaufort in the Eastern Cape. In 1937 Nkomo studied for a BSc degree at the South African Native College (Fort Hare). He also obtained his BA degree from the University of South Africa (UNISA) while furthering his medical studies. During the following year he taught at the Kilnerton Institute near Pretoria for six months after which ha started the first secondary school at the Dougall Hall in Marabastad. The school later moved to Atteridgeville to become Hofmeyr High School. On his return from a world youth conference in Washington DC Nkomo joined the African National Congress (ANC) with the belief that it would provide an outlet for his radical beliefs. He was, however, expelled for his militant beliefs as the ANC advocated non-violence at that specific time. While teaching Nkomo obtained a scholarship to study medicine at the University of the Witwatersrand (Wits) in 1941. He was also elected to the Wits Student Representative Council and represented the university at the National Union of South African Students (NUSAS). When the ANC National Youth League (ANCYL) was founded in 1944 Nkomo became chairman of its provisional executive committee, but was later replaced by Anton Lembede in order to complete his studies. On completion of his medical course he did his internship at McCords hospital in Durban and went into practice in Lady Selbourne and Atteridgeville. In 1953 he attended a Moral Re-Armament Conference in Switzerland, a worldwide movement promoting peace, which he joined two years later. 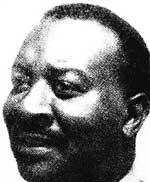 Nkomo was also a steward of the Methodist Church and attended the 1966 World Ecumenical Council meeting held in London. He became an advocate of non-violence. During the Sharpeville massacre of 1961 Nkomo acted as a mediator between the government and the oppressed, and the different races. Following the declaration of the state of emergency he, and several other leaders, failed to persuade the government to consult with the leadership of the banned organisations. In the same year Dag Hammarsköld, Secretary-General of the United Nations Organisation, visited South Africa and Nkomo and Dr A.B. Xuma were among the African leaders who discussed the political situation in the country with him. Concurrently with these events Nkomo read academic freedom speeches at various leading universities, opposing the government’s emerging homeland policy. Until his death Nkomo served as the Trustee of the Bantu Welfare Trust, which aimed to improve the lot of urban Africans and promoting co-operation between black and white South Africans. Despite his busy schedule he served on a number of medical, religious, welfare and school councils in Atteridgeville and Lady Selbourne. He was also Honorary Physician for Itireleng School for the Blind near Hammanskraal. In January 1972, a few months before his death on 26 March of the same year, he was elected President of the South African institute of Race Relations and in appreciation of his services to the community the Dr W.F. Nkomo Secondary School was established in Atteridgeville. In November 1971 the residents of the same area celebrated Nkomo Day in recognition of his contribution to their welfare. Nkomo died of cardiac arrest at the H.F. Verwoerd Hospital in Pretoria and was buried next to his wife, Susan, at the Rebecca Street Cemetery in Pretoria west. They had five children.